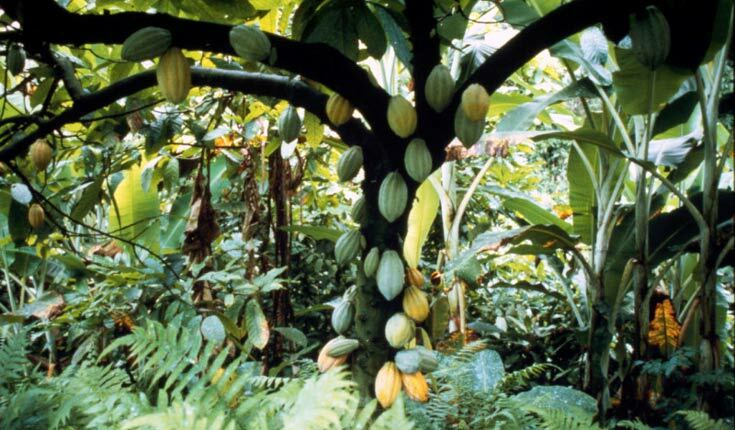 Cacao trees are small and delicate, usually no more than 20-40 feet high. They need taller trees (such as hardwoods) to shelter them from the elements. Trinitario: A cross of Criollo and Forastero, which originated in Trinidad. 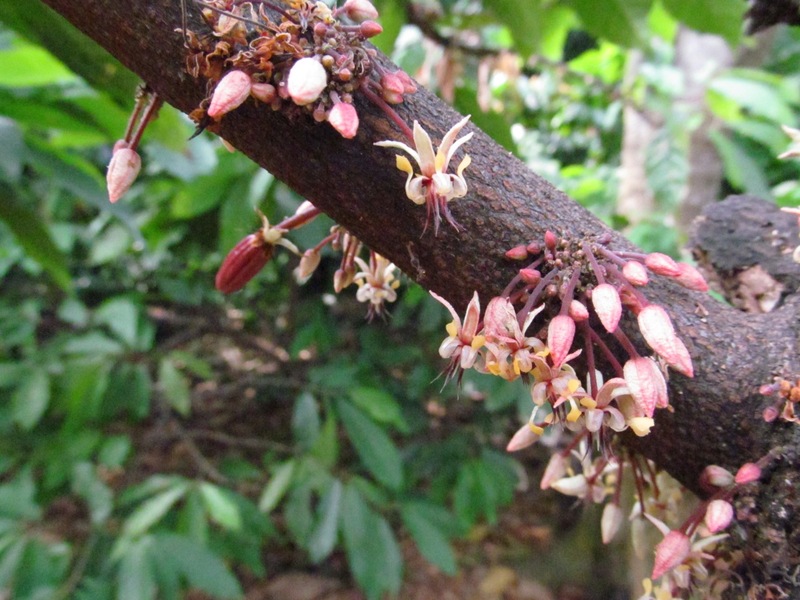 All chocolate begins its life as a delicate pink or white blossom on Theobroma cacao’s bark. Eventually, the flowers become football-shaped pods in green, yellow, orange, red, purple or maroon. They range from eight to 14 inches long and, unusually, grow directly from the tree’s main branches and trunk, rather than smaller branches and stems. 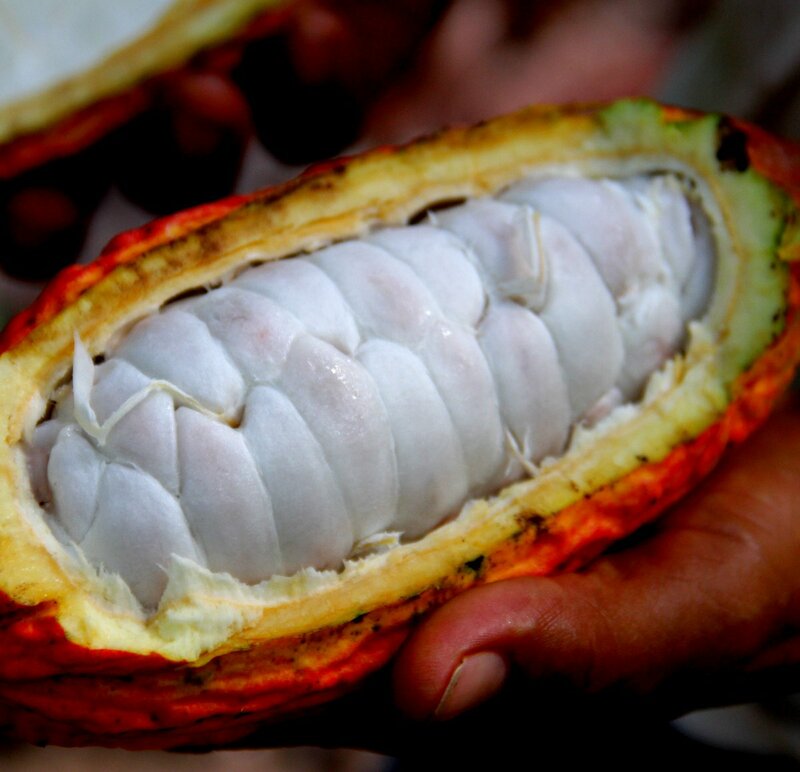 Inside each pod is a sweet white pulp and juice, covering 50 to 60 seeds. While the juice is mild and sweet, the seeds, on the other hand, are so bitter that even animals won’t eat them. 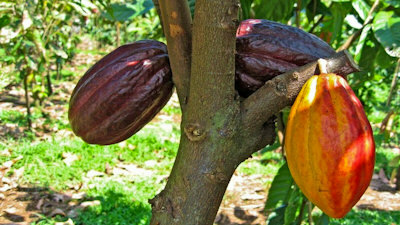 Because the cacao tree is so fragile, the beans must be harvested by hand. 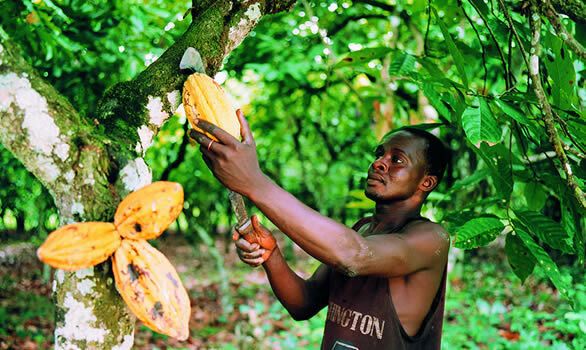 Workers use mallets or machetes to slice off the lower pods and long-handled steel knives to snip the higher ones. The pods are then split open with a mallet or machete. The white pulp is scooped out. The unprotected seeds quickly turn purple when exposed to air. They look and smell noting like chocolate. The beans are put into large wooden boxes or raked into piles or and covered with banana leaves to ferment and dry. During the next two to eight days, they lose most of their moisture and almost half their weight. They turn brown. They are then loaded into burlap sacks and sent off to factories around the world. After roasting, the beans go through a “winnower” to remove the shells, leaving behind the pure cocoa “nibs.” The nibs then go into the “mélangeur,” a machine that grinds them into a thick paste called “chocolate liquor” — a misleading term, since chocolate liquor contains no alcohol. The chocolate liquor is pressed to remove the cocoa butter, which is saved. 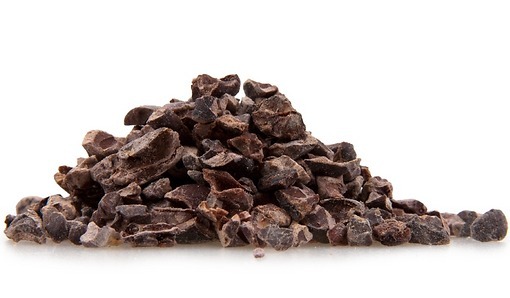 What’s left is a powdery disc known as cocoa “presscake.” The presscake is pulverized into cocoa powder. At this stage, if the cocoa is of low quality, it will be mixed with vegetable fats, sugar, and flavorings to become substandard chocolate. However, even after all this processing, the chocolate still has a gritty texture. So it is melted and mixed until it has a dough-like consistency, then run through a series of heavy rollers. The rollers refine the chocolate into a smooth paste, which is then “conched” — the final step that will determine the flavor and texture of the chocolate. 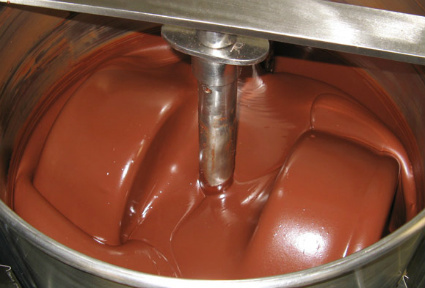 The conching machine kneads the chocolate mixture for not less than 24 hours at a low temperature – approximately 110 degrees Fahrenheit. Conching smooths the chocolate and mellows any acidic tones. Before conching became common, solid chocolate was gritty and not very popular. But in 1879, in Bern, Switzerland, renowned chocolatier Robert Lindt reportedly left a mixer full of chocolate accidentally running overnight. The result was smooth, mellow chocolate. And thus the modern chocolate bar was born. The word “conching” itself – from ancient Greek kónkhē (mussel) via Latin concha — arises from the original shape of the conching machine, which resembled a seashell. Some manufacturers either replace or supplement conching with an emulsifying machine that works like an eggbeater to break up sugar crystals and other particles. This step lends a fine, velvety smoothness to the final product. After conching, the chocolate is stirred while heated, cooled and reheated to precise temperatures (“tempered”). Tempering affects the way cocoa butter crystals form, and it determines how hard, shiny and glossy the final chocolate will be. 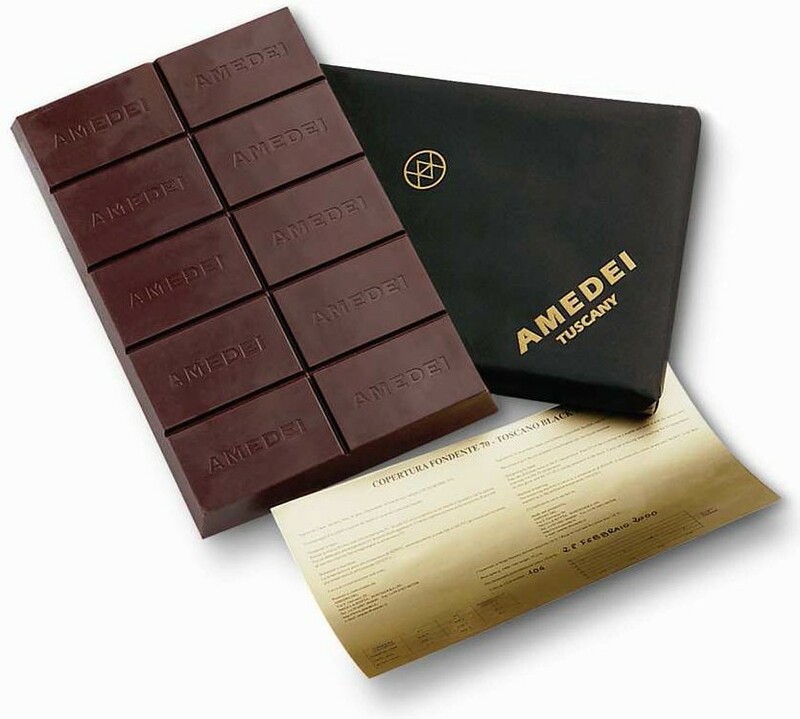 If you’ve never had a truly fine chocolate bar, you can find premium chocolate at high-end retailers or internet sources such as Chocosphere.com. Premium bars can run upwards of $20 each. But they are world’s away from the overly sweet and adulterated sweets that are handed out each Halloween. This entry was posted in Food, Uncategorized, Word Origins and tagged amadei, bonnat, cacao, chocolate, cocoa, conching, criollo, equator, forestero, melangeur, tempering, theobroma, trinitario, winnow by Jackie Fuchs. Bookmark the permalink.